The case of Rachel Dolezal, the “trans-Black” who is the head of an NAACP chapter and has apparently reported false “hate-crimes” is all over the Internet. It’s hard to know if this is just a case of rent-seeking by someone taking advantage of Black privilege or a case of someone who really does identify as a Black person. Or both. Regarding the first possibility, in addition to her position as head of an NAACP chapter, Dolezal has parleyed her Black identity into a position as professor of Africana Studies at Eastern Washington State University and chair of the office of the police ombudsman commission in the city of Spokane (on the application she claimed to be “a mix of white, black, Native American and a number of others.” Reminds one of Elizabeth Warren’s claim of Cherokee ancestry which she made to three separate employers, the University of Texas Law School, the University of Pennsylvania Law School, and Harvard Law School. Or Vijay Chokal-Ingam. Or non-Jews in Hollywood who pretended to be Jews to get ahead (crypto-gentiles?) (see here, Note 40). Her story also recalls Brenton Sanderson’s article on Andrew Bolt, the Australian who got in serious trouble when he called attention to the fact that there was a huge increase in the number of people claiming Aboriginal descent after Aborigines were granted loads of benefits. Lots of them look White to me. The ideological nature of Section 18C of the Racial Discrimination Act [which provides penalties for saying true things related to race and ethnicity] was starkly illustrated in the case brought against conservative commentator Andrew Bolt. In 2009 Bolt wrote two columns pointing out that individuals with very small amounts of Aboriginal ancestry (or in some cases none) were taking advantage of a raft of government scholarships and affirmative action job vacancies by choosing to identify exclusively as Aboriginal. 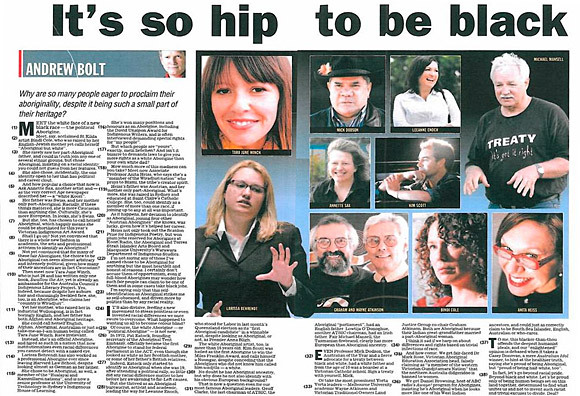 Bolt claimed these people were choosing to identify as Black to leverage their career and social advancement. A change in people’s propensity to identify as being of Aboriginal and/or Torres Strait Islander origin is found to be a significant contributor to the increase in counts of Aboriginal and/or Torres Strait Islander people which cannot be attributed to measurable demographic factors. In particular, the large increase in the count of Aboriginal and/or Torres Strait Islander children aged 5–14 years in 2011 has been driven by a greater propensity of their parents to identify themselves and their children as being of Aboriginal and/or Torres Strait Islander origin in the 2011 Census when compared to the 2006 Census. Watching MSNBC last night, the take seemed to be that she could have been head of the NAACP without all the deception. Maybe. But I rather doubt she could have got the teaching job or the ombudsman job without the subterfuge, much less the full scholarship at Howard University. Despite the perks that Dolezal received because of her identity, the concept of Black privilege is completely incomprehensible to such people. It conflicts with their bedrock view of America. Cognitive dissonance for the politically correct. But I think there may be something deeper. It’s hard to believe that Dolezal is completely cynical about this, with her marriage to a Black man, and full custody of her Black adopted brother (whom she claimed was her child). She seems completely estranged from her family and completely immersed in Black culture. She reminds me of Pres. Obama’s mother, Ann Dunham, who had two marriages, both to non-Whites. This was before such things would have been remotely fashionable, so it suggests an even greater rejection of her family (who opposed the marriage) and heritage. Wiki says that “Dunham enriched her son’s education with … recordings of Mahalia Jackson and speeches by Martin Luther King Jr.” I suppose Dolezal would do the same. Psychologically, such estrangement from family and race can stem from a lot of reasons. It’s no accident that the Frankfurt School’s Authoritarian Personality idealized families who scored low on their F (Fascism) scale where children rejected the values and culture of their parents. In the present media environment, however, disturbed parent-child relations may not be the whole story. After all, Black culture is lionized in the media, while Whites and their culture have been pathologized for decades. In such a situation, where Black music and Black culture are portrayed as superior in the elite media, given basic psychology it would not be at all surprising to find Whites identifying as Black—the wigger phenomenon. Finally, there is the amusing situation where post-modern forms of personal identity are coming under scrutiny. We hear that Dolezal is “transracial” in a way analogous the very au courant transgender phenomenon where there is a disjunction between personal identity and physical, biological reality. Milo Yiannopoulos satirizes the whole thing, claiming to be transracial and welcoming Dolezal to the club (“A big slobbery welcome to my newest trans-Black sister, Rachel Dolezal“). In perhaps the most stunning display of the true trans-black experience, Rachel Dolezal replied to the question “Are you African American” yesterday with: “I don’t understand the question”. The logic here is impeccable. If race is indeed nothing more than a social construct, why should skin color or any aspect of genetics be relevant? So we can imagine a White person checking the box for being Black and obtaining Black privilege. After he or she arrives at Harvard and they figure it out, her admission and scholarship are removed. Then there’s a delicious lawsuit. I can hardly wait. Addendum: As commenter points out, another explanation is that her parents are missionaries who adopted four Black children. Despite the present estrangement, it makes sense that, having been socialized in such an environment—an environment where Blackness was likely idealized, that she would come to see herself as Black or at least very sympathetic to Blacks and their culture.